Kristoff is guilty of this; there's SO MUCH crammed into SO LITTLE SPACE. Thing is, it's okay not to know everything - plot points can be revealing, they can help build the world even as we're already in it, and this can actually have more impact. It's okay to discover things as we move along - so long as we can move along. The story was - I can't even say it was halted, because I don't think it even really began until about page 50*. All the rest was set-up for the world and the characters (and it was set-up that could have been accomplished much more quickly and efficiently, especially as it was reinforced throughout). It became very muddled and bogged down in the minutiae; I almost gave up, and I was really expecting this to end up on my timesuck shelf, which would have made me very, very sad. I absolutely ADORED how they grew together. Aside from the animal companion aspect, one of the things I was looking forward to most was the strong-female-character-doesn't-need-a-love-triangle thing, which has been pushed a bit in reviews and the book's description. I do have to say, it doesn't ignore those tropes completely - it actually crept perilously close to those lines... But Yukiko's not a damsel, and she's not too swoony/sighy, so the book is saved from that, though it doesn't avoid it altogether. What makes it work - and what makes saying it's not a "love-triangle book" not seem like a lie - is the way it's used: it ends up being very dark and very adult, much more realistic and less bodice-ripping than one thinks of when dealing with "love triangles" and all of the annoyances attached. And this is the best way to approach the strong-female-character-doesn't-need-a-love-triangle thing, I think. You don't have to be absolutely anti-love, anti-weakness, anti-flaws, anti-femininity to make it work; no, you just have to be realistic, and let some of the harsher realities bleed in to the fantasy world. Kristoff did this well, and my blackened little heart was pleased. And those were the things that this whole book hinged on for me; thank god they worked. But I have to say, as a bonus: I also love that it works as a stand-alone. It is a series, and I knew that going in, but in this day of endless series' it's always nice to have the option of whether to go on or leave it as is. I've gotten so used to the gimmicky "pick up the next installment to find out!" type of series endings that I'm just thrilled when one comes along that's confident enough to stand on it's two legs (or, um, last chapters) and say: This is it; if you want more, there will be more, but this is how this part ends. Stormdancer ends on solid-enough ground that it makes for a great open-ended stand-alone, while still leaving plenty of room to grow as a series. I love when series books end in such a manner, and I love when authors/editors respect the audience and story enough to not feel like they have to "hook" the reader into a next book by leaving you hanging with the first book. It shows a confidence in the story, that they think you'll want to come back anyway, and it actually makes me much more receptive to reading more in the series, knowing they will feel complete. 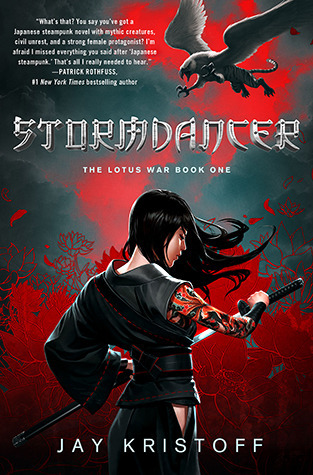 So, I guess in the end, I'd say Stormdancer is highly recommended, but with a caveat - you either need to be a patient reader willing to slog through the beginning and have everydamnthing thrown at you until it starts to stick, OR you need to be willing to skim the beginning. But if you're willing to get over the initial hump, it's smooth sailing flying from there on out. Lol. I got a kick out of this review. Thanks for your balanced thoughts. I'm looking forward to this one. Though it was a bit heavy handed with the descriptions in the beginning, I kind of appreciated that fact. I didn't question anything after that, I knew the world. I didn't have to backtrack and try to figure out who was who or what that funny word was, I was never confused after the beginning. I, too, thought it was a great book! Wonderful review! Lovely review! I am literally always on the lookout for a YA book with a more mature romance that is either a standalone or still a complete book even if it is part of a series. Slow beginnings don't really bother me, but I understand that they do turn off lots of people. Sounds like it definitely worked out for the best for you that you were able to stick with it. I can't wait to now read this book myself! Another one of those books that suffer from being overhyped before publication. I was lucky enough to get an e-ARC via NetGalley and read the book quickly enough. But there were times when it felt more like work than fun. omg YES, Josephine! The eye thing was driving me nuts. Not just because of the repetition, but because of the silliness it introduced into the story. It's fine to have her notice, and it's fine to have him have a stand out feature, but when she gets all swoony and sighy and dreams about him and those eyes, I'm over it.